Über weiten Teilen Deutschlands und in weiten Teilen Mitteleuropas besteht heute das Potential für Gewitterbildung. Das liegt an der instabilen Schichtung der Atmosphäre, welche in Verbindung mit der zunehmend vorhandenen Energie der Sonne im Laufe des Nachmittags lokale Wärmegewitter entstehen lassen wird. Die meisten dieser Gewitter werden lokal eng begrenzt bleiben, was bedeutet, dass während ein Ort ein Gewitter abbekommt, der Nachbarort davon möglicherweise nichts mitbekommt. Die generelle Zugrichtung der Gewitter ist über Deutschland von Norosten nach Südwesten. Die Hauptgefahr bei den heutigen Gewittern stellt Starkregen mit mengen von 20 bis 40 Litern pro Quadratmeter in kurzer Zeit her. Damit können Überflutungen inklusive Verkehrsbehinderungen und Sachbeschädigungen vorkommen. Weiters können in und nahe den Gewittern Sturmböen von bis zu 70km/h auftreten. Auch kleinkörniger Hagel, der meist unter 2cm im Durchmesser betragen wird, ist nicht auszuschließen. Hagel mit mehr als 2 oder 3cm Durchmesser, Tornados sowie kräftige, strukturierte Gewitter sind unter den heutigen Bedingungen äußerst unwahrscheinlich. Halten Sie sich nach Möglichkeit über die aktuelle Wetterlage am Laufenden. Unten finden Sie die heutige “Convective Forecast” – Schwergewittervorhersage für Mitteleuropa. This entry was posted in Uncategorized and tagged Deutschland, Gewitter, Österreich, Unwetter, Wetter, Wettervorhersage on May 15, 2018 by Linus Höller. 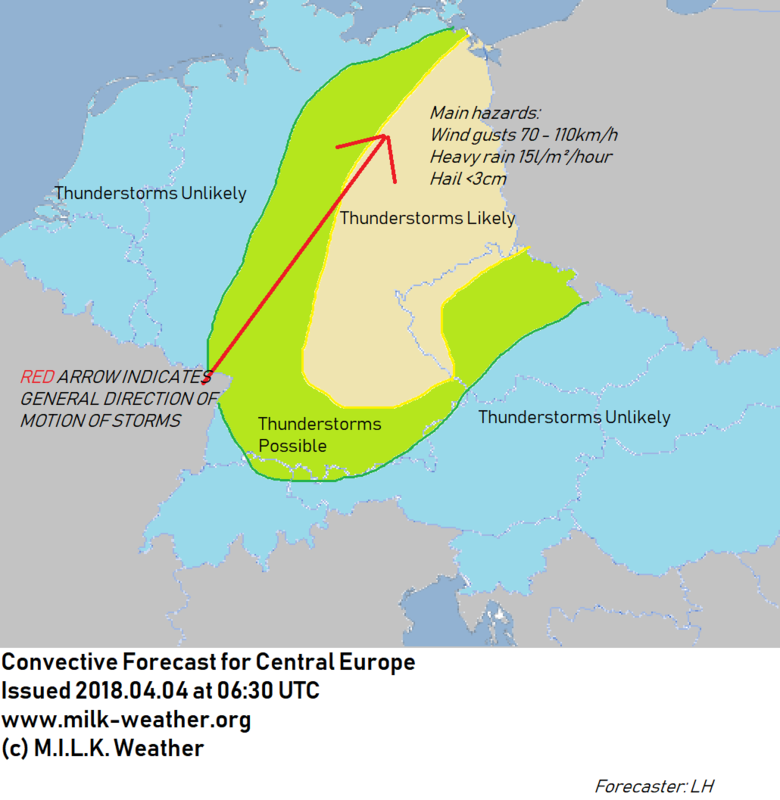 As soon as spring has fully arrived in central Europe, the thunderstorm season is already setting off. A cold front is moving eastwards across Germany today, ahead of which partly strong showers and thunderstorms will form. Currently (08:40 local time) there are already a number of strong showers to be found in the southwest of Germany. The showers and thunderstorms will move towards the northeast, and will have reached Brandenburg and Berlin by the evening. 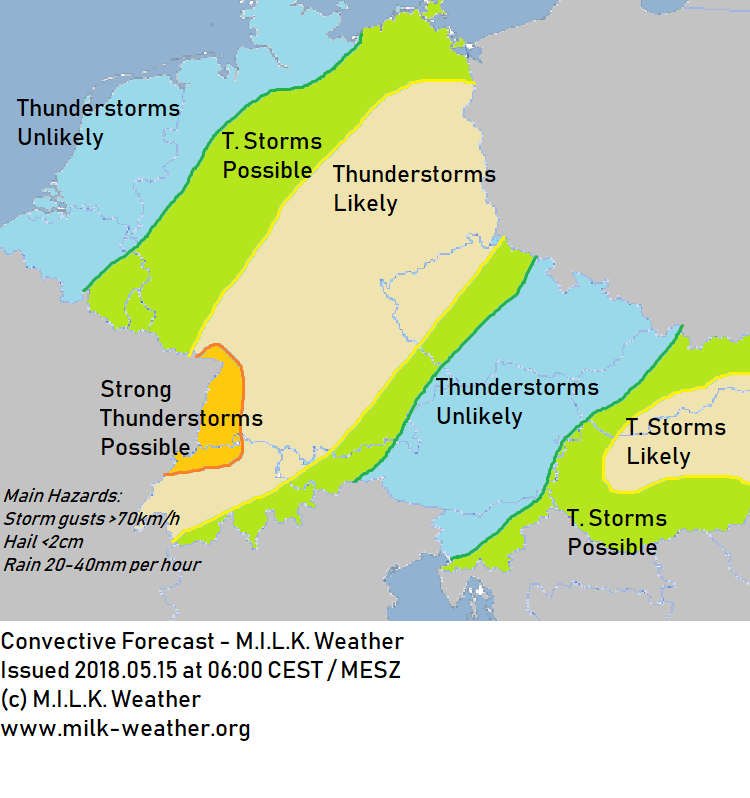 According to the latest predictions, the highest potential for strong and severe thunderstorms will be found in the afternoon and evening in Saxony, the southern half of Brandenburg and parts of Saxony-Anhalt. Further, in showers and thunderstorms high rates of precipitation of around 15 liters per square meter in an hour, and locally hail up to 3cm in diameter are to be expected. If possible, keep up to date with the current weather situation. This entry was posted in Uncategorized on April 4, 2018 by Linus Höller. Kaum ist der Frühling so richtig in Mitteleuropa angekommen, da geht die Gewittersaison auch schon los. Heute erreicht Deutschland von westen her eine Kaltfront, in deren Vorfeld sich teils kräftige Schauer und Gewitter entwickeln werden. Schon derzeit (08:40 Ortszeit) finden sich im Südwesten Deutschlands einige starke Regenschauer. Die Schauer und Gewitter werden sich im Tagesverlauf von Südwesten nach Nordosten verlagern, und bis zum Abend Brandenburg und auch Berlin erreicht haben. Nach derzeitigem Stand der Vorhersagen besteht das größte Potential für kräftige Gewitter und Unwetter am Nachmittag und Abend in Sachsen, der Südhälfte Brandenburgs und teilen Sachsen-Anhalts. Außerdem muss in Schauern und Gewittern mit hohen Niederschlagsmengen von bis zu 15 Litern pro Quadratmeter in nur einer Stunde, sowie vereinzelt auch mit Hagel bis maximal 3cm in Durchmesser gerechnet werden. The situation in Europe overall is rather calm currently, with one exception: Iceland should brace for the arrival of a very powerful storm within the next few hours. The storm system, currently packing wind speeds in excess of 130km/h and a central pressure of 987hPa, is expected to bring severe storm gusts to much of the island, and peak winds may exceed well beyond 200km/h in exposed locations. Warnings have been issued accordingly, see below. This entry was posted in Uncategorized on February 21, 2018 by Linus Höller. 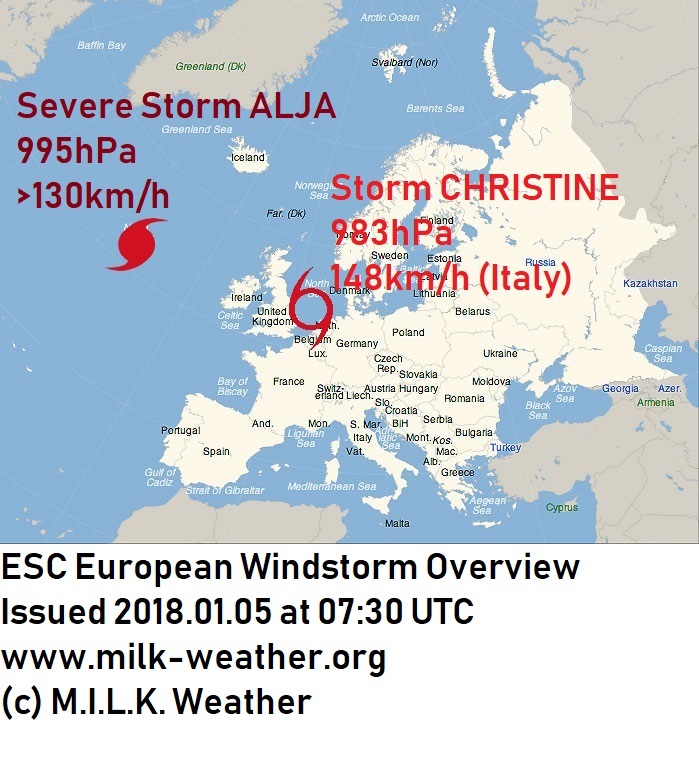 In today’s ESC European Windstorm Update, the overall situation in Europe is rather calm. There is currently only one storm system that is being tracked. 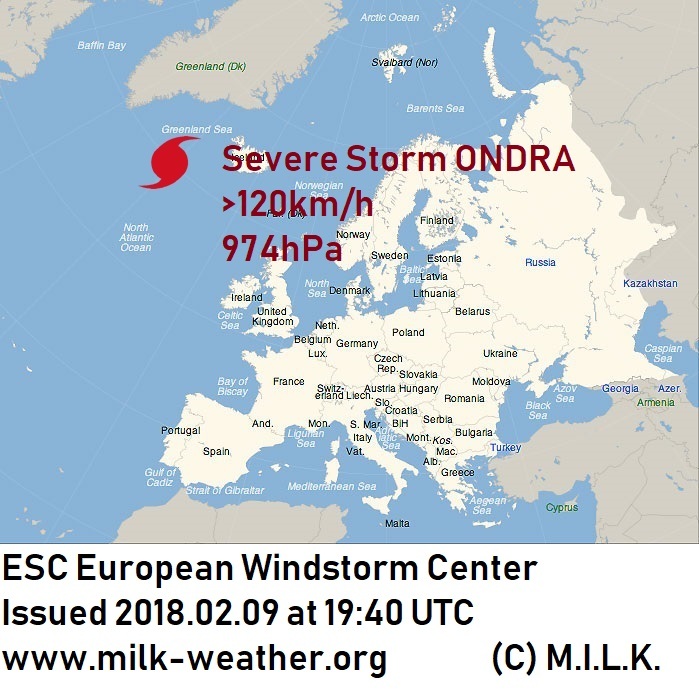 Storm ONDRA is currently located out over the North Sea, with a central pressure of 974hPa. Peak gusts in the storm are currently estimated to exceed 120km/h, classifying it as a “severe storm”. The storm is expected to head roughly east or northeast, with the most severe gusts in the next 24 hours to be expected on the islands of the North Sea and in Iceland (in that order). Storm gusts are also to be expected in much of Ireland and the UK within the next 24 hours. A separate low-pressure system is expected to form roughly around the English Channel between 24 and 36 hours from now, which will bring storm gusts or even severe storm gusts to the coasts of Belgium, the Netherlands, the German North Sea coast, Denmark, and Norway. Storm Watches have been issued accordingly. See below. 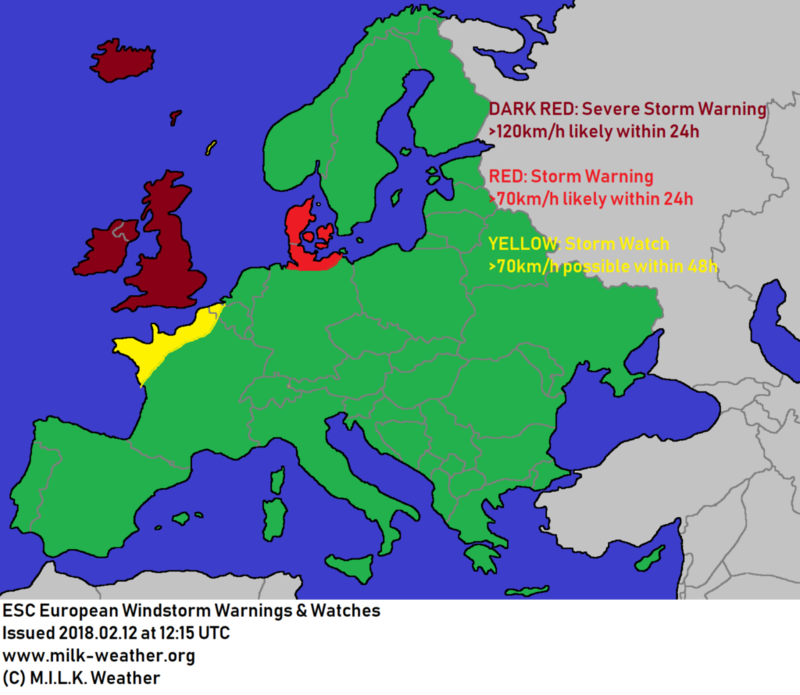 Below are the ESC European Windstorm Overview, as well as the European Windstorm Warnings & Watches. This entry was posted in Uncategorized on February 9, 2018 by Linus Höller. 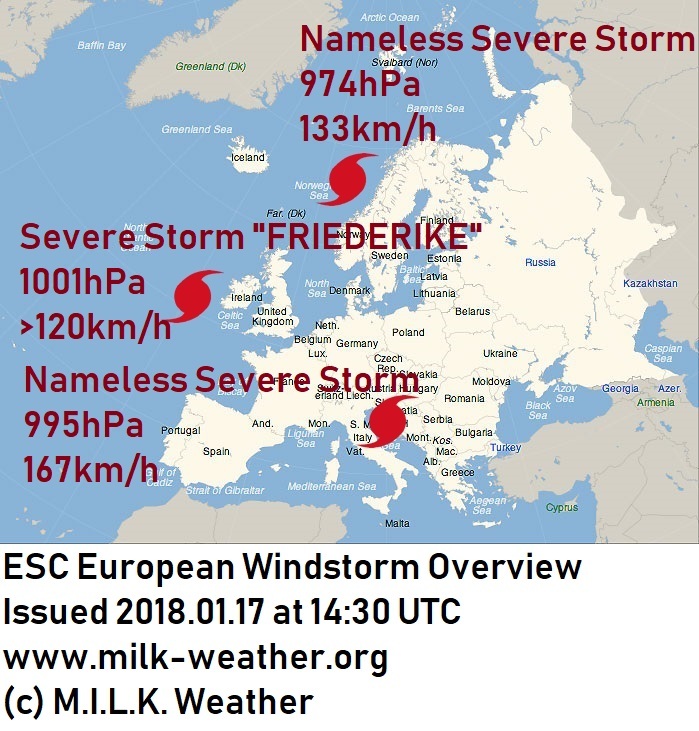 Severe Storm FRIEDERIKE (Orkan Friederike) moved through the Benelux and over Germany today, and is now moving into Poland and the Czech Republic. As predicted, the storm intensified over the North Sea after it crossed the British Isles, however it intensified more than was predicted by most forecast models. As of now, between 3 and 5 people are reported dead because of the storm. In Germany, all long-distance trains were canceled and in some regions, all train service was terminated. The Amsterdam Schiphol airport in the Netherlands canceled all flights due to the severe wind; this and the impact of the storm on other flight operations caused significant delays and cancellations throughout Europe. Countless trucks were overturned, trees were uprooted and buildings damaged; there is currently no reliable figure as to the approximate amount of damage. This entry was posted in Uncategorized on January 18, 2018 by Linus Höller. A couple of stormy days are ahead for much of Europe – we will take a look at the specifics in this ESC European Storm Center update. Three storm systems are currently spread across the map. Of note, other than storm FRIEDERIKE, is a low-pressure system located over the Balkans which will bring severe storm gusts to much of the eastern Mediterranean & the coasts of the Black Sea. Storm FRIEDERIKE (named Storm FIONN in the UK), currently off the western coast of Ireland, is expected to further intensify as it heads for mainland Europe; within the coming 12 hours, the storm will cross Ireland and the UK and start making landfall in northwestern France. It is expected to move across much of western and central Europe, packing gusts of potentially up to 200km/h. Ireland: Wind speeds will first start noticeably picking up in southwestern Ireland within the next few hours, and by tonight at 18:00 UTC, gusts are expected to be exceeding 110km/h in the far southwest. Later in the evening, similar wind speeds are to be expected for much of the western and southern coast. By midnight, much of Ireland (with exception of the North) will experience the full force of the storm, with gusts expected to well exceed 120km/h even far inland. Peak gusts for Dublin are expected to be at around 100km/h. The wind will start calming down starting in the west in the early morning hours. United Kingdom: storm gusts are expected to reach the far southwest of the country by tonight at 21:00UTC, and by midnight much of Wales and the southwest of England are expected to have full storm-force gusts. In the hours following midnight, hurricane-forced gusts well beyond 120km/h are expected at the western, but also potentially the southern coast of the island. In the morning hours before sunrise, gusts exceeding 130km/h are expected in Wales and much of England, even far inland and away from exposed locations. The wind will start calming down in the west at around 06:00 UTC on Thursday, however severe storm gusts are expected to persist in the east until several hours later. France: Storm gusts will reach the northwestern coast over the course of the evening, exceeding 110km/h in many locations by 21:00 UTC. Such severe storm gusts will mostly stay limited to the coast, however, and further inland (including in Paris), “only” regular storm gusts between 70 and 90km/h are to be expected. The wind will persist until well into the morning, with peak gusts near 130km/h expected at the northern coast and in the far north of the country, and gusts of up to 110km/h likely to be registered further inland. 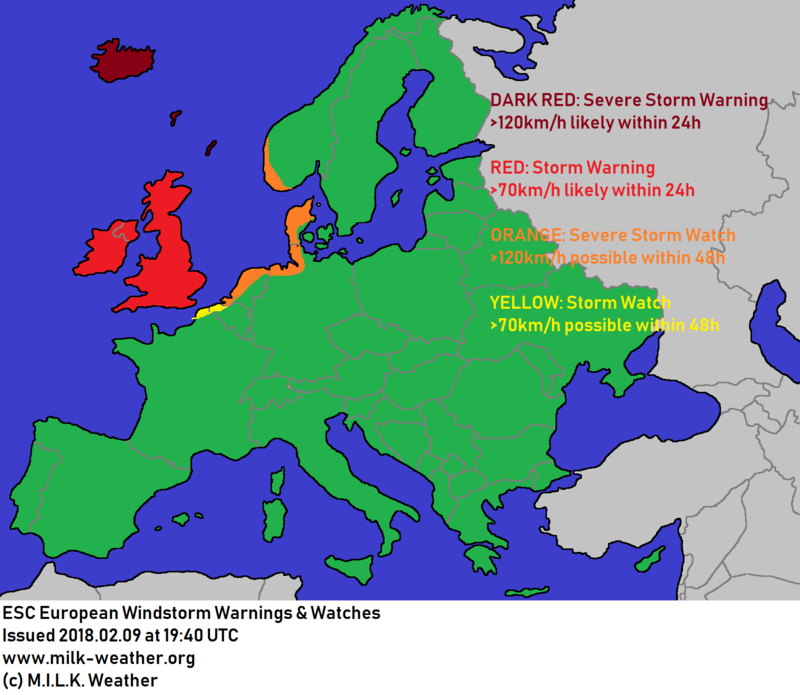 Benelux: Wind speeds will start picking up in Belgium and the far southwestern Netherlands at roughly 05:00 CET, and severe storm gusts will reach the coast roughly two hours later. By 09:00, much of the Benelux states are expected to have strong storm gusts exceeding 110km/h, with speeds at the coast well above 125km/h. The storm is expected to intensify as it crosses over the North Sea in the morning hours, and gusts of around 130km/h even inland, as well as gusts nearing 160km/h at the coast are not to be ruled out. Peak wind speeds are expected at the Belgian coast at roughly noon, and between 11:00 and 13:00 in the Netherlands, where gusts of 140km/h may be widespread at the coast, and gusts of 120km/h or above are to be expected in much of the southern half of the country. Peak gusts in Den Haag may be anywhere from 110 to 140km/h according to latest predictions, 120km/h are expected for Rotterdam, 100 to 120km/h in Amsterdam. The wind will calm down, starting in the west, in the afternoon and should be largely back to normal before sunset. Germany: Western Germany will start feeling the effects of storm FRIEDERIKE by 10:00am at latest, with gusts starting to reach speeds near 100km/h. Wind speeds will start approaching and locally exceeding 120km/h in western Germany by noon or the early afternoon hours. By 16:00 CET, the main wind field of the storm will have reached central Germany, still packing gusts of 120km/h or potentially more. Northern Germany, e.g. Hamburg, will stay unaffected by the wind field, however the far south, including Bavaria and Baden-Württemberg, should brace for gusts in excess of 100 or even 110km/h. In the evening, the storm will move towards the east, mainly affecting Hessen and Saxony, where gusts of more than 120km/h are to be expected. Strong storm gusts will continue to pose a risk in Bavaria in the evening as well. 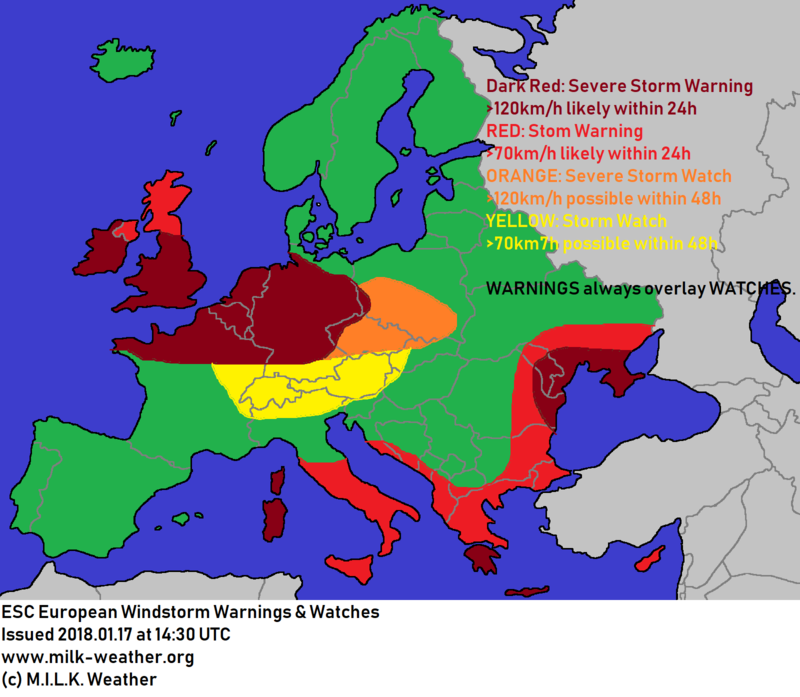 Czech Republic, Southern Poland, Austria, Switzerland: The predictions for these regions are still fairly uncertain, however the Czech Republic and Southern Poland will face wide-spread storm gusts around 100km/h and potentially nearing 120km/h after the storm passes over Germany. In Switzerland, and especially in Austria, severe storm gusts are to be expected on the mountains. In Austria, storm gusts of around 100km/h are also predicted for the lowland north of the Alps. This entry was posted in Uncategorized on January 17, 2018 by Linus Höller. Windy conditions are nothing unusual in Iceland, thanks to its exposed position in the Northern Atlantic. However, the coming days promise to bring wind speeds that may cause complications even in Iceland. 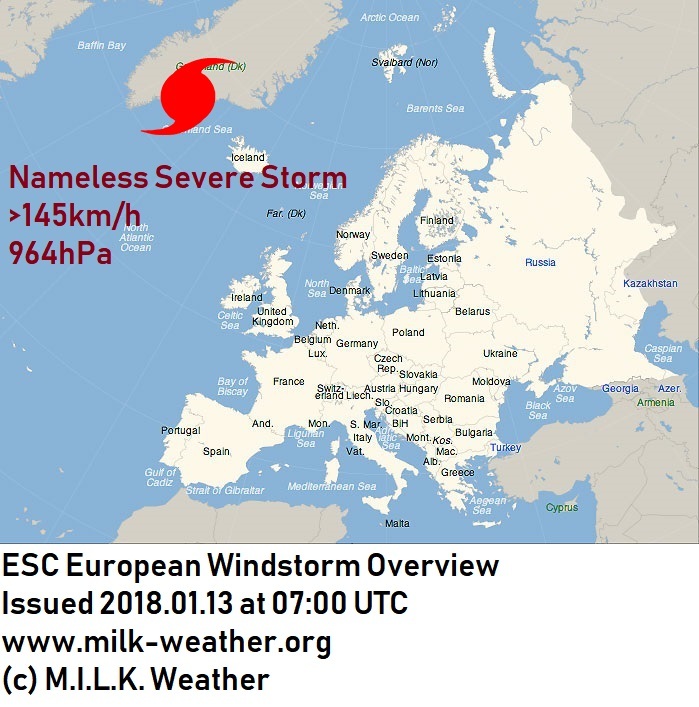 A nameless severe storm system, currently located on the eastern coast of Greenland with a central pressure of 964 hPa, is expected to gradually move towards Iceland and further intensify. Wind peaks are calculated to exceed 145km/h currently, and are expected to reach up to 180km/h within the 48-hour forecast period. Therefore, a severe storm warning has been issued for Iceland, but also for the island of the North Sea; in these areas, one should brace for some very rough conditions between 12 and 48 hours from now. 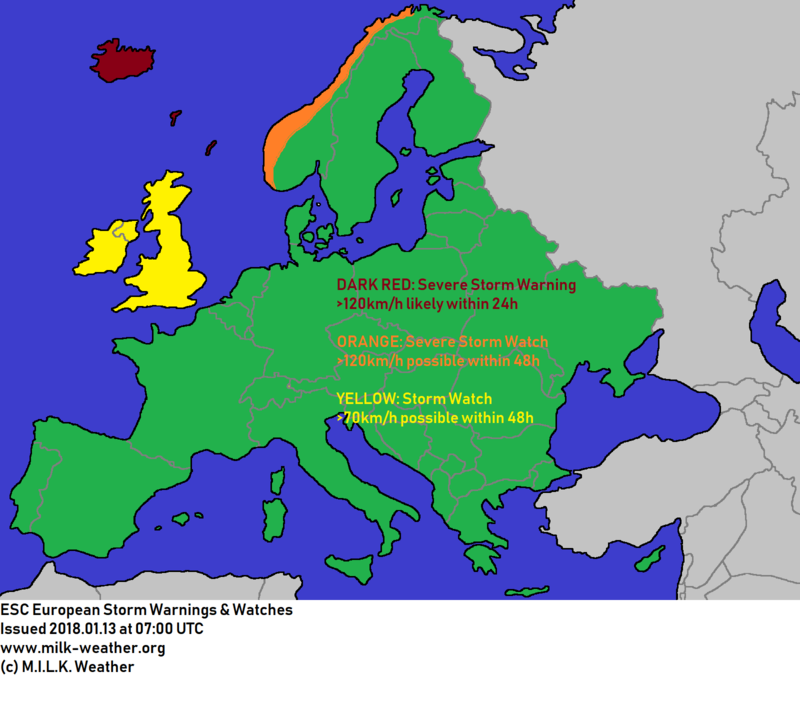 A severe storm watch has been issued for the coast of Norway, as the storm system’s severe storm gusts may affect it between 24 and 48 hours from now. A storm watch has been issued for the British Isles, as the outskirts of this storm will move across the islands between 24 and 48 hours from now, however at much lower intensity than in the other areas. This entry was posted in Uncategorized on January 13, 2018 by Linus Höller. Storm BURGLIND, which dominated Central European weather for the past few days, has moved off and dissipated into little more than a slight atmospheric depression. 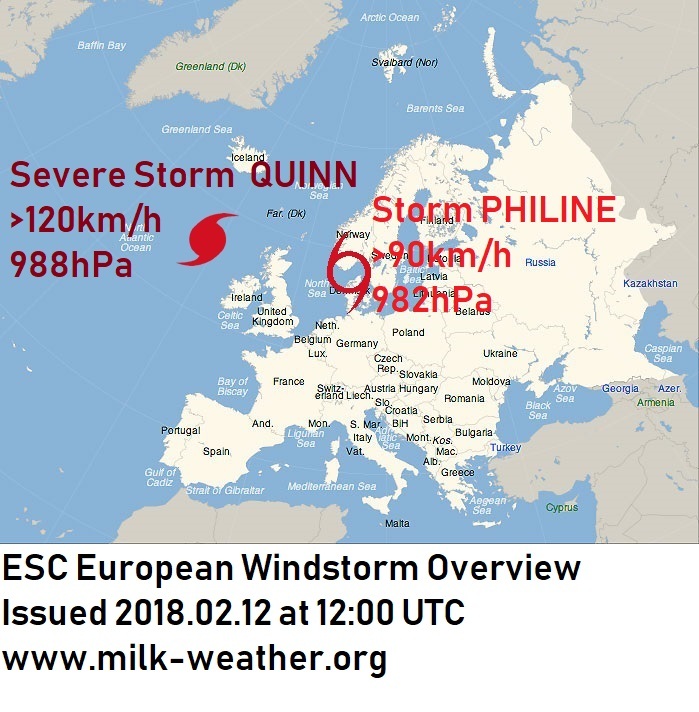 Storm gusts persisted, however, especially in the Alps, where peak gusts of close to 150km/h have been registered today thanks to a storm located in the North Sea and named CHRISTINE. The storm has a central pressure of 983 hPa, however is expected to weaken and not be a significant threat to any region. 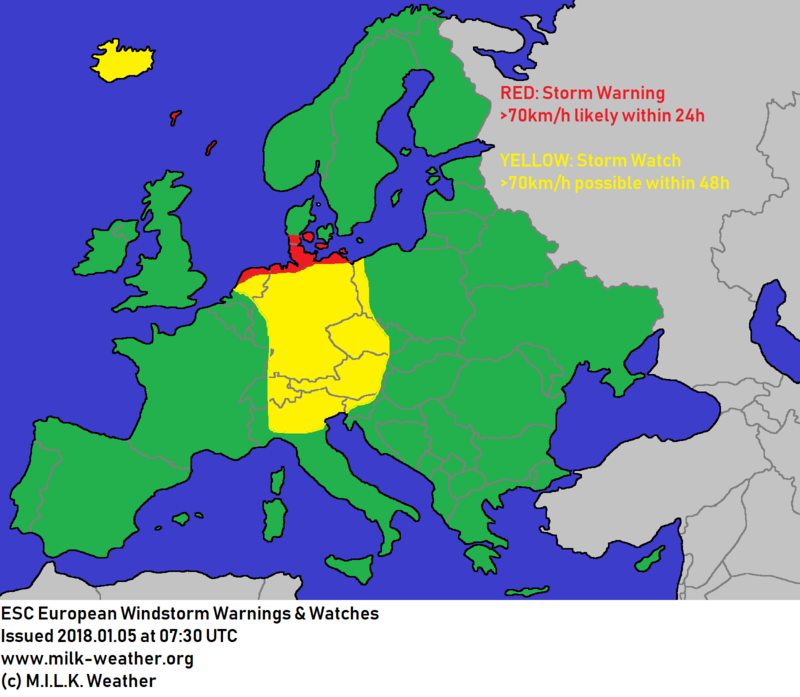 Nonetheless, a storm warning has been issued for the coasts of Germany and the Netherlands, and a storm watch has been issued for much of central Europe. A second storm is currently located over the northern Atlantic; storm ALJA, at a central pressure of 995 hPa. 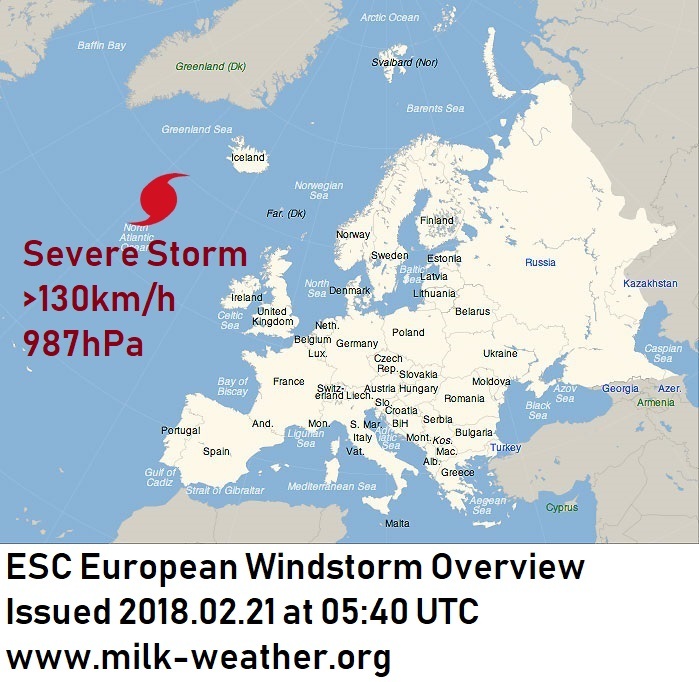 Peak gusts in this system currently exceed 130km/h, however the storm is expected to lose force and not post a significant threat to the British Isles. Also of note: A storm warning has been issued for the islands of the North Sea, as stormy conditions are expected there today, and Iceland has been placed under a storm watch for the possibility of increased wind speeds between 24 and 36 hours from now. Below you will find the European Windstorm Overview, as well as the issued storm warnings & watches. This entry was posted in Uncategorized on January 5, 2018 by Linus Höller.